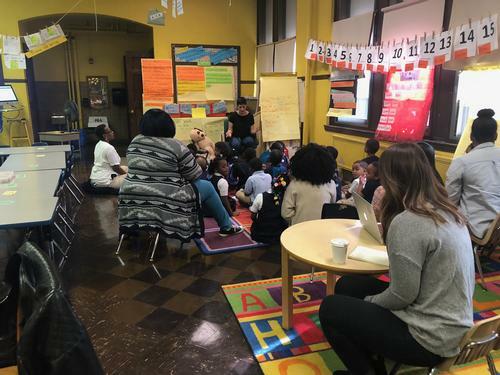 On a recent Monday morning, Paul L. Dunbar School’s kindergarten storytime got a special guest—librarian Kayla H. from the Cecil B. Moore neighborhood library. Dunbar Elementary’s Community Partnerships Coordinator wanted a special treat for two kindergarten classes, so she invited Ms. Kayla and her bag of books to come to their school. After greeting Ms. Kayla with monster voices, the students began listening to her read Dreamers by Yuyi Morales. They learned new words in both English and Spanish and discovered the new worlds of opportunity that the library can open up. Next, in keeping with the season, the students laughed and roared along with Monster Trouble by Lane Fredrickson, in which the heroine has to defeat the monsters in her room—with KISSES! Then the kindergarteners shook their sillies out after this book with a sing along led by Ms. Kayla. The storytime concluded with The Book with No Pictures by BJ Novak. The students were not initially impressed with the idea of a book with absolutely no pictures, but by the end they were begging Ms. Kayla to read more! 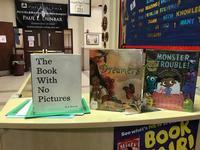 Students and teachers at Dunbar Elementary gave the Free Library a warm welcome and a reluctant goodbye. This storytime let students laugh and connect with books, while inviting a new, playful connection with the library and a unique, silly, and entertaining book experience. Free Library librarians across the city offer engaging and exciting storytimes like these every day, and would love to hear from the teachers and schools in their neighborhood. Let us know how we can help! Want to learn more about connecting your local school with the Free Library? Contact your neighborhood library and email the School Partnerships team at schools@freelibrary.org to start a conversation today! Librarian Kayla Hoskinson shares stories with Dunbar kindergarteners and teachers. The stories in a school-aged storytime can inspire, tickle, and leave students wanting to hear more.